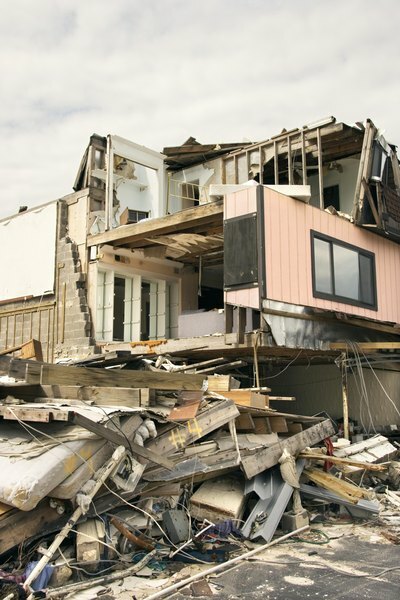 Homeowner's insurance proceeds can replace your destroyed house. 2. Who Gets an Insurance Claim Check: The Contractor or Homeowner? 3. What Is the Loss Payee Clause in Mortgage Hazard Insurance? Replacing a destroyed home is a long, difficult process. Fortunately, if you have homeowner's insurance, the cost won't be one of your problems, especially if you are insured for the full replacement cost value. The RCV is the amount it will cost to rebuild your house from the ground up in the event it is completely destroyed. The process will vary slightly depending on your insurance company, but will follow the same basic steps. Contact your insurance company immediately. Inform your agent that your home has been destroyed and that you want to begin the claims process. Have a copy of your policy on hand if possible. If it was destroyed along with your home, request a duplicate copy form the insurance company. Take photos of the damage and remove any remaining personal property that is exposed and subject to further damage. Just make sure to save anything you remove until the insurance adjuster has a chance to inspect it. Fill out the required claim forms. The format will vary by company, but the basic information will be the same. Going to your insurance company in person will save you time. Detail the damage to your house in the paperwork and compile a list of the items lost along with the house. Be as detailed and complete as possible. Arrange to have an insurance representative or a public adjuster inspect the damage. Review the settlement figure offered by the insurance company carefully. If you feel you are entitled to more, you will want a second opinion from an independent adjuster. Negotiate with the insurer to reach a satisfactory figure. If you can’t come to an agreement, you may require arbitration through your state’s insurance department. Hire a contractor to begin the rebuilding process. Give him the details on your property and inform him of the funds you will receive from the insurance company to replace the property. He will use this to develop a budget. Obtain the funds from the insurance company. While you may receive the money in one lump sum, you will more likely obtain the funds in stages as you show that the rebuilding process is moving along. Without proof that you’re using the funds for the purpose intended, the insurance company won’t release the proceeds. You can hire a public adjuster if you feel that you’ll get a better estimate than your insurance company would provide.Just be aware that you will have to pay as opposed to the free service offered by the insurance company. Bankrate: Does Homeowner's Insurance Protect You?